Using camcorders for a live shooting is fun. But sometimes, we are in need of a larger display than what we get as a viewfinder in camcorders. For security monitoring, sports recording or similar purpose, a larger display is all we crave for. The good news is, there are ways now a days that can turn your iPads into the display unit for camcorders. And that’s what we are in need right now. And in this article, we are going to show you the exact steps that will let you do this wonder. A camcorder(we took Sony camcorder for this case). A Power bank of minimum 20,000 mAh. USB 2 port power adapter 5V. Lighting to USB camera convert. Take the iCapture grabber card and connect the power bank to it. With another cable, connect the grabber card with USB 2 port power adapter. Now, it’s time to power up the USB 2 port power adapter and connect it with the iCapture grabber card. Do that with USB 3.0 and mini USB cable. Once done, connect the cable with the iPad. The connection should work fine so far. Now it’s time to connect the grabber card with the camcorder you have in hand. This can be done with the default cable that you were given with the camcorder. In the grabber card, the port is located in the opposite direction of the other ports. After installing and activating the MediaLink Live app, you have to turn on the camcorder. The camcorder view should be come up on your iPad through the app. As you are done with the process of setting up, place the whole setup ion the tripod you’ll be using. You may need a camera bracket to do that. Which is available with a few bucks. Sometimes, you may not be in need of placing the whole setup on a tripod. You can set it accordingly then. After setting it up on the stand, do some random checks whether the whole system works fine or not. You may see some lags between the actions you are taking on the camcorder, and the view you are getting on the iPad. If some lag takes place, we recommend you to pick good quality wires. Make sure the USB hub and the 2 USB port is compatible with the iPad. Ensure a sturdy and shake-proof positioning of the hardware on the tripod. 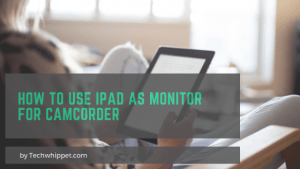 We are at the end of our guide on how to use iPad as a monitor for camcorder. However, this is not a wireless way of viewing your camcorder view at iPad. If you need a wireless connection, we would come back with another guide at some other day.